The phrase “walking on eggshells” is an idiom that is often used to describe a situation in which people must tread lightly around a sensitive topic for fear of offending someone or creating a volatile situation. 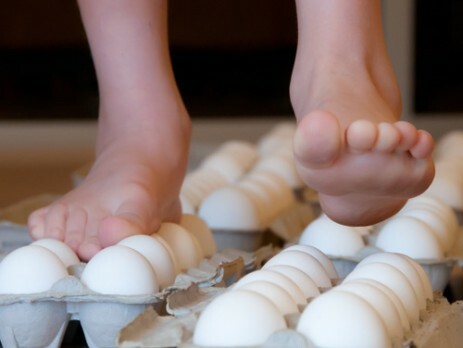 Literally walking on eggshells would require exceptional caution, incredible skill, and a sense of self-control that would be nothing short of amazing. Wait just a second . . . what if eggs were really much stronger than most of us imagine? What if nature’s design of the incredible edible egg was so perfect that the thin, white outer coating of an egg was strong enough to withstand the weight of your body? Wake the kids! Phone the neighbors! It’s time for the Walking on Eggshells challenge.